Train Staff with Outside Seminars or In-house Training? Renewing and refreshing employees’ skills, and whether to send staff to outside seminars or conferences or to provide training internally to do so, is sometimes a tricky question for managers. Outside seminars can expose staff to ideas and processes used in other organizations that can bring back fresh ideas and solutions; inside training can have rewards like building teamwork and common ground among staff, as well as amplifying or unifying “how things are done.” Inside training can take place in a classroom group setting or with an online solution where individuals work together in virtual classrooms. CSU Institute for Palliative Care courses have been designed to be easily accessible online, so professionals in any practice setting anywhere can participate and can advance their palliative care practice. But right now, one organization is learning what happens when their staff from across multiple sites take an online course together. It’s a virtual experience with unique benefits. Reid Jacobs, MSW, LSW, ACHP-SW, who teaches for the Institute, shared his insights from leading a class of 24 students through the online Post-MSW Certificate in Palliative Care course who are employed in a multi-state healthcare system. The eight-month course is providing these master’s-prepared social workers with focused education to advance their knowledge and skills in delivering palliative care to patients and families. Students gain tools for improving their interaction in interprofessional teams in whatever setting they work. As a multi-state system, social workers from many sites are enrolled, so participants did not necessarily know each other at the outset. The course introduction exercise allowed some that had never met their colleagues before to become engaged with them, and allowed others who work at the same facility, who were well acquainted with one another, meet their counterparts elsewhere. Virtual relationships formed. The participants learned that some are members of palliative care teams that include a full range of practitioners, while others work only with one other professional in their palliative care team; and that palliative care training is important for others including a NICU social worker and a medical floor social worker, who also opted to be part of the group. Their diversity and richness of backgrounds and experiences has been invaluable so far, as veteran social workers share with those who are brand-new to the field; and new entrants share perspectives to enlighten the views of the veterans. Having begun their course in November, these participants, all from the same company have completed modules on the social worker’s role in teams, and skills social workers use in their work including critical thinking and collaborative relationship-building. The participants’ reflections in their forum posts on the self-awareness and mindfulness section, as noted by Jacobs, shared that they had definitely heightened their awareness of their own thoughts, biases, and views, and has made them more aware of their purpose and role in their daily work as they influence patient or team discussions. The virtual classroom allows a geographically disconnected team to build relationships, establish trust, and become more connected within organization. Experiencing the assessment, planning and documentation modules, and symptom management and the social worker’s role together has helped them all gain understanding of how practice approaches varied or were the same across the system. But of even greater benefit was the gaining of a sense of “team,” comradery, and connectedness, as they worked through the practical forums in which they shared of actual examples of patient care work, and encouragement and insight from the instructor as well as each other were generously exchanged. Much lies ahead for the cohort of twenty-four, including delving into enhanced counseling skills, motivational interviewing, working with the dying, valuing diversity, leaning into challenging situations such as complicated family dynamics, personality disorders, and the impact of traumas like suicide, disasters, assaults on families and staff. Additionally, the course delves into much more rich content, covering bereavement, self-care, ethics, quality improvement and leadership, and more. While so far Jacobs reflects that the students are clearly building a sense of teamwork and comradery evidenced in their forum posts, he has read descriptions of new patient-care processes that have been discussed, designed, or implemented in the organization as a result of tools gained in the course. One example was a spiritual assessment tool. Hospital admission intake forms generally document patient remarks about their religious affiliation, but don’t reflect their real stance on religious or spiritual beliefs. For patients facing serious or life-threatening illness, social workers can now employ the assessment tool to help them begin a discussion with patients about what influences their care choices, and helps the social worker convey these influences to other members of the care team. Participants voiced satisfaction in being able to better support the patient as a whole as they navigated their illness. The online course in palliative care will conclude with a final project, and Jacobs stated that several students are already under way in designing a project that will be used within the organization to enhance care. 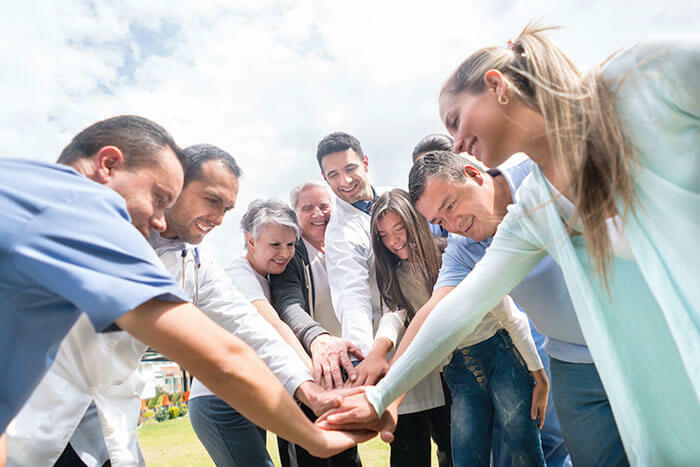 So more than organizational teamwork and comradery, this healthcare organization will benefit from the synergy of the work occurring among social work professionals who are dedicated to living and applying palliative care in their daily roles. For social workers newly entering the field to veterans of 25+ years, for people working in small settings with very broad responsibilities, to practitioners who are part of an interdisciplinary palliative care team, the experience of completing an in-depth learning experience is resulting in a variety of benefits. Veterans learn from new voices, but can pass along their extensive experience to new organizational colleagues. Clinicians from direct care units can apply this learning among their patients and families equally as those who consult across many units. New tools are helping patients gain a greater voice in decision-making about what is important to them. And the organization is gaining a return on their investment with new processes as well as engaged, connected staff who have an almost ten-fold higher likelihood to retain and apply this learning in the future (Knowles, 1996) because of learning, discussing, and applying it together. As organizations face the question of whether to send staff to outside training or provide in-house and online training, we encourage leaders and staff alike to explore the wide array of Institute courses can bring, not only in terms of new skills, but in the intangibles among the team. Learn more about the Institute’s palliative care social work courses. Click here. Knowles, M (1996), Adult Learning. The ASTD Training & Development Handbook: A Guide to Human Resource Development, 1996.